MASSIVE MACHINES A researcher stands in the cavernous spectrometer of KATRIN, an experiment in Germany to measure the mass of particles called neutrinos. Diana Parno's head swam when she first stepped inside the enormous, metallic vessel of the experiment KATRIN. Within the house-sized, oblong structure, everything was symmetrical, clean and blindingly shiny, says Parno, a physicist at Carnegie Mellon University in Pittsburgh. "It was incredibly disorienting." Now, electrons - thankfully immune to bouts of dizziness - traverse the inside of this zeppelin-shaped monstrosity located in Karlsruhe, Germany. Building the experiment took years and tens of millions of dollars. Why create such an extreme apparatus? It's all part of a bid to measure the mass of itty-bitty subatomic particles known as neutrinos. KATRIN, which is short for Karlsruhe Tritium Neutrino Experiment, started test runs in May. 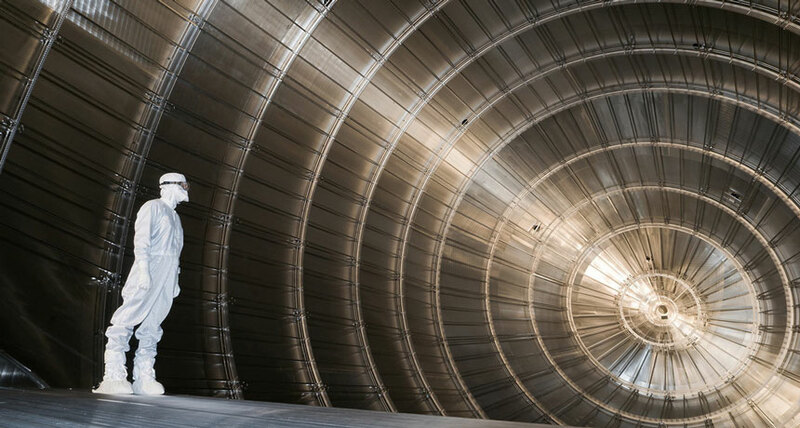 The experiment is part of a multipronged approach to the study of particle physics, one of dozens of detectors built in an assortment of odd-looking shapes and sizes. Their mission: dive deep into the standard model, particle physicists' theory of the subatomic building blocks of matter - and maybe overthrow it. Developed in the 1960s and '70s, the standard model has some sizable holes: It can't explain dark matter - an ethereal substance so far detected only by its gravitational effects - or dark energy, a mysterious oomph that causes the cosmos to expand at an increasing rate. The theory also can't explain why the universe is made mostly of matter, while antimatter is rare (SN: 9/2/17, p. 15). So physicists are on a quest to revamp particle physics by probing the standard model's weak points. Major facilities like the Large Hadron Collider - the gargantuan accelerator located at CERN near Geneva - haven't yet found where the standard model goes wrong (SN: 10/1/16, p. 12). Instead, particle physics experiments have confirmed standard model predictions again and again. "In some sense we are victims of our own success," says Juan Rojo, a theoretical physicist at Vrije Universiteit Amsterdam. "We don't have hints about what is the next step." New experiments like KATRIN might be able to ferret out answers. Also joining the ranks are Muon g-2 (pronounced "gee minus two") at Fermilab in Batavia, Ill., and Belle II in Tsukuba, Japan. A behind-the-scenes look at these experiments reveals the sweat, joy and sacrifice that goes into each of these difficult enterprises. These efforts involve hundreds of researchers, sport price tags in the tens of millions of dollars and require major technological undertakings: intricate electronics, powerful magnets and ultraclean conditions. Researchers have built complex apparatuses with their own hands, lugged tons of equipment across continents and cleaned the insides of detectors until they gleam. Here's a glimpse at three of the latest standard model challengers.